Jimmie Jackson was passionate about the dozens of classic cars and trucks he began collecting just five years before his death. So auctioning them off will be bittersweet for his son. 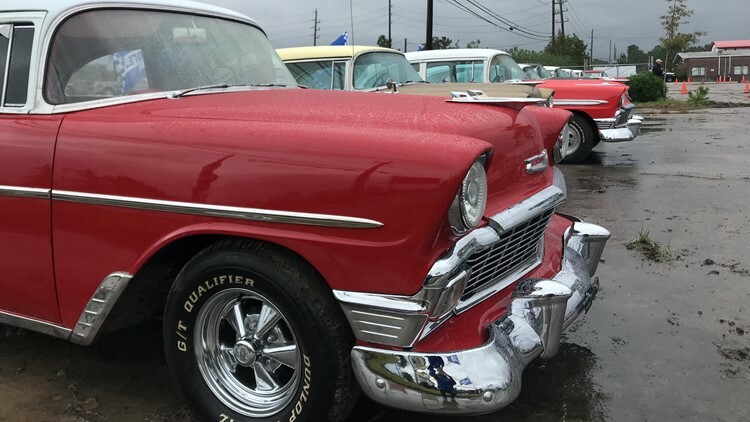 HUMBLE, Texas — A large private collection of classic cars and trucks from the 1950s through the 1980s will go on the auction block Saturday morning in Humble. Many of the more than 120 vehicles are in perfect condition and some are project cars, making the auction appealing to a diverse crowd of buyers. Dan Jackson is currently the owner of the collection, which is estimated to be worth more than $500,000. Jackson inherited the collection unexpectedly from his father, Jimmie Jackson, who died in a car crash this year at the age of 81. Collecting the vehicles had become almost an obsession for Jimmie who amassed nearly the entire collection within the last five years. "He was the type of guy who wouldn't spend a dime on anything," said Dan Jackson. "At first, it was three or four cars, and I thought 'This is great.' Then he became a dealer and it went to 20, 30, 40..."
Jackson says he told his dad to take it easy on the collecting one time, but never again. "After that he didn't talk to me for like four days, and I never brought it up again because I knew he just enjoyed it," Jackson said. "He loved it. He was having a ball." Saturday's auction will be bittersweet for Jackson as he lets go of his dad's prized collection but he says he knows his father would be happy that someone new will be able to enjoy a great, classic ride. The auction begins Saturday at 9:30 a.m. at 2401 Wilson Road in Humble.